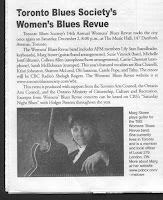 "Guitarist Margaret Stowe is a constant delight." "It's hard to take your ears and eyes off Stowe." 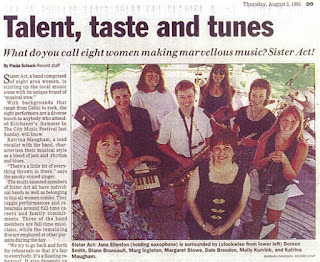 "Most impressive was Margaret Stowe on guitar." "She is an amazing player"
"I love this album! 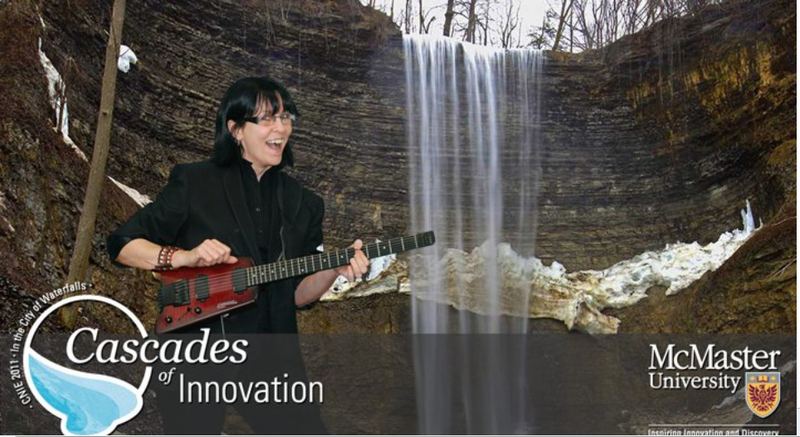 I continue to be impressed by Marg's facility on the guitar." "Stowe's departure point is jazz, but her style ranges from folk to blues to world beats, propelled by her trademark high energy and eclectic tastes." 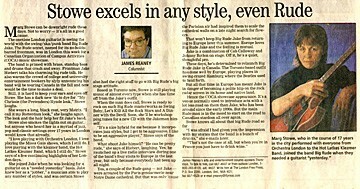 "..Still, it's hard to take your ears and eyes off Stowe. Stowe also smokes the lights out on guitar..."
"Stowe's departure point is jazz, but her style ranges from folk to blues to world beats... propelled by Stowe's trademark high energy and eclectic tastes.."
"Stowe jumped into every song with flourish and style." 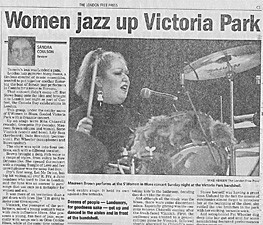 Welland Tribune, October 2005 Concert Review: with Jackie Washington. ".... the vocals often amounted to filler for dazzling displays by the horn-charged supporting combo. "London jazz guitarist Marg Stowe, tireless creator of music ensembles wanted to put together another featuring the best of female jazz performers in Canada...... ...she rattled the tree branches in the park with her exciting versatile work." 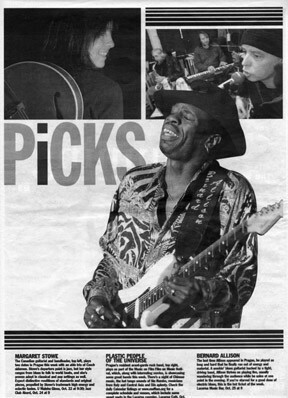 "When Denise sang it (Summertime)..I couldn't believe what Marg Stowe was playing on the guitar. It was so emotional ....... ...She can do anything." "Guitarist Stowe is, simply, amazing. She plays long fluid lines that never seem to stop, the ideas pouring out of her in an uninterrupted flow. ...At times as gentle as Bickert, she turns around and lets fly with the energy of George Benson, but always with accuracy and so, so tasteful." By Harry Currie.Kitchener Record. 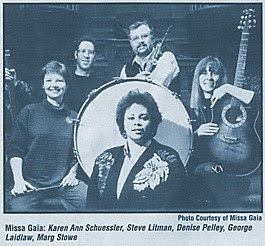 Oct. 94 Review: Pelley-Stowe Band at Chicago's. 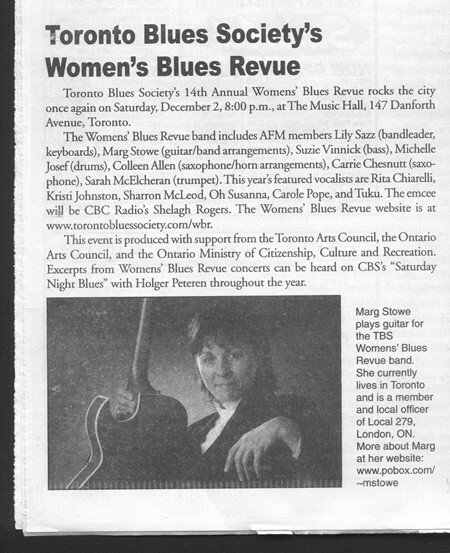 "The Toronto Blues Society's 14th Annual Toronto Women's Blues Revue rocks the city once again"
Members of the Missa Gaia Jazz Ensemble, with musical director Karen Ann Schuessler.